" Bringing the Presence of the Past into the Present "
New Hampton Had a Train Wreck? Although I grew up in New Hampton, I do not recall hearing about two locomotives involved in a head-on crash in our town. 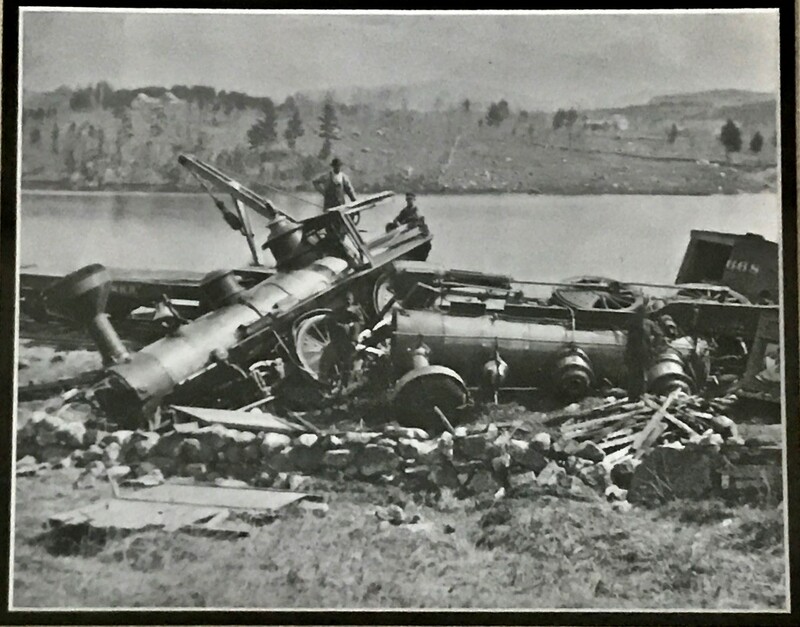 A stereoscopic card on eBay, with its faded image of the wreckage of two locomotives, led to many questions. These were quickly answered by a framed collage hanging on the wall of the New Hampton Historical Society Museum. 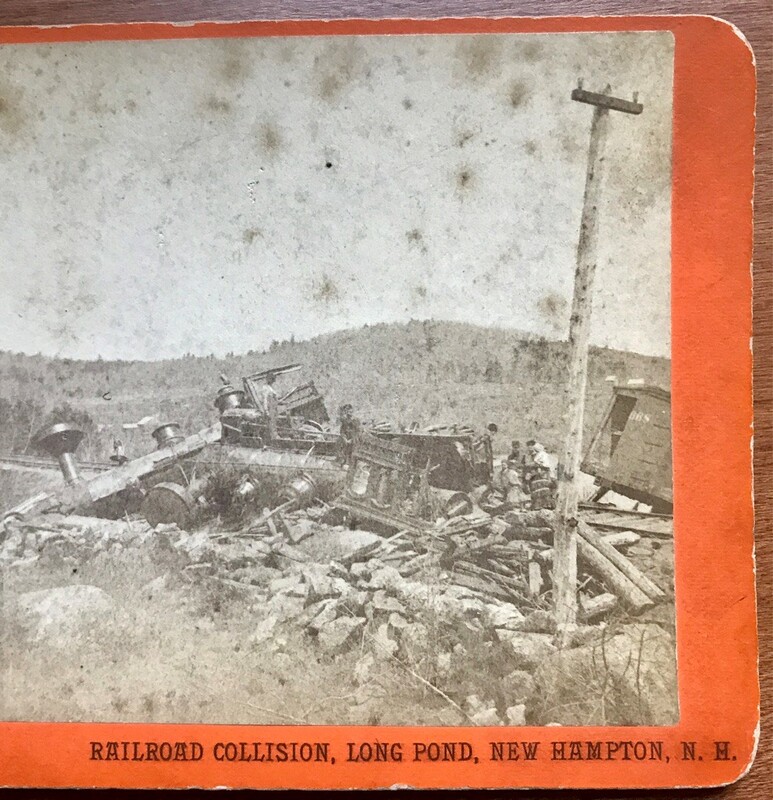 Local resident Volker Antoni, through photos and text, narrates the story of The Railroad in New Hampton, including the collision. The following information is from Volker’s work. New Hampton, NH was incorporated on November 27, 1777. By 1797-1798 the townspeople were already considering the construction of a meeting house. At the annual town meeting in March of 1798, the voters of New Hampton decided to erect a meeting house. Two more town meetings in April and September were required to settle all of the details of the building project. But, the building was ready for use by the next annual town meeting in March of 1799. It is believed that the architect/builder was Samuel Kelley, one of the town’s first settlers. The New Hampton Town House began as the meeting house for the Town of New Hampton, serving both for religious services and town meetings. The Town House stands on the town common on a 5.5 acre town owned lot at the northeast corner of Town House Road and Dana Hill Road, considered to be the “Center”. This location was referred to as the “Town Common”, the “Center” and is now known as the “Old Institution”. Click here for more on its history. Click here for some interior and exterior photos. A hundred years ago, grand drapes and painted backdrops were the primary artistic feature of the cultural life of almost every village and town in Northern New England and were found in town and grange halls, theaters and opera houses. Click here for further information including photos of the curtains and biographies of the artists who painted them. Click here for the Survey & Treatment Proposal for the Ives curtain - the Grand Drape Advertising Curtain depicting the covered bridge that once spanned the Pemigewasset River in the vicinity of the present Route 104 bridge. Click here for the Survey & Treatment Proposal for the Thompson curtain - New Hampton Town House.